This week’s book is by Neil Perry, a renowned Australian chef who believes in using the highest-quality produce in every dish. Neil Perry’s Good Cooking is full of great recipes. I’ve chosen pan-fried chicken and trifle recipes which I’ll definitely be making for one of my birthdays! Remove the chicken from the fridge 1 hour before cooking and season liberally with sea salt. Preheat the oven to around 70°C/150°F so you can rest the chicken there once it’s cooked. Use a heavy-based frying pan that is large enough to fit all of the chicken breasts. Heat the frying pan over medium-high heat. Brush the chicken breasts with olive oil and place in the hot pan, skin side down. Cook for 5 minutes or until the skin is crisp and golden, then turn and cook for a further 4 minutes or until the chicken is just cooked through. Transfer the chicken to a plate and rest in the oven while you make the sauce. To make the sauce, pour the vermouth into the frying pan and scrape the bottom well. Add a good pinch of sea salt, pour in the cream and cook for 2 minutes at a rapid boil. Reduce the heat and whisk in the butter. Remove from the heat, stir in the parsley and horseradish then season with black pepper and a squeeze of lemon juice. Place the chicken breasts on four plates and pour a generous amount of sauce over the top. Serve immediately. 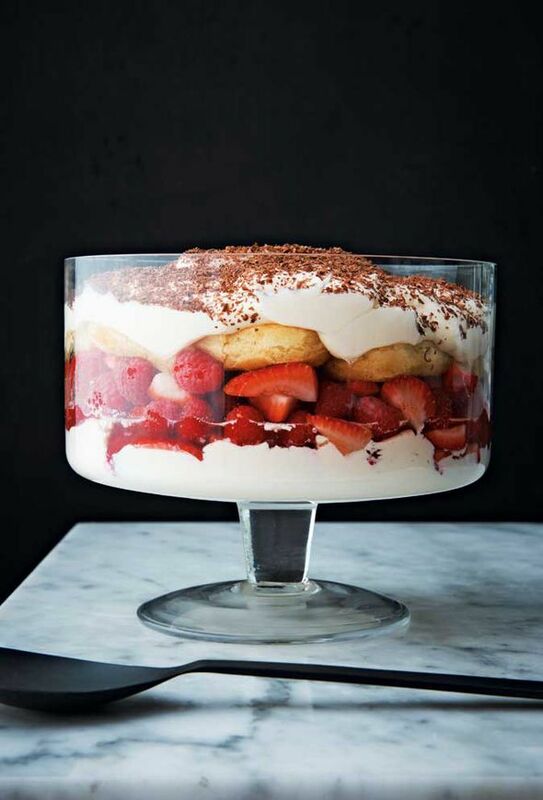 Spoon half the mascarpone cream into a 3 litre trifle bowl. Mix the berries together and scatter over the mascarpone cream. Dip the savoiardi into the Sauternes, then arrange on top of the berries. Spoon the remaining mascarpone over, cover and refrigerate for several hours. Grate chocolate on top to serve.